EnterMedia MagicSing ET30KH Karaoke system brings families and friends together! EnterMedia MagicSing ET30KH is a WiFi streaming karaoke system that has access to thousands of karaoke songs in EnterMedia music server(subscription based with one year subscription card included with your purchase). The streaming service can be used anytime and anywhere through internet over WiFi. 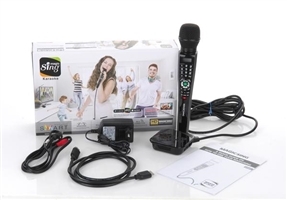 MagicSing ET30KH karaoke system is designed for everyone who wants to have a good time without spending much time figuring out how to use the technology. With included HDMI cable, just plug it into your TV and enjoy the system(you can also connect the direct RCA audio output to a sound system for better quality sound). Thousands of songs are in EnterMedia music server(subscription required). The microphone has keypad that contains numbers and function keys for quick song selection and adjustment of the music. 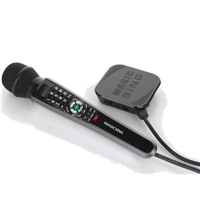 MagicSing ET30KH allows the user to record their own performance for replay or storage(to Micro SD card or USB flash drive for replaying on other musical devices). -Includes one Wired microphone with controls. -Microphone Input(Phono 1/4" type which works with many aftermarket Microphones).